The pastime of running is enjoyed the world over by countless millions. There is not much needed to start, with minimal expense for the novice or enthusiast the pastime is gaining more and more support. In the Florida Keys, running is one of the most popular pastimes, behind fishing, and it isn’t surprising really when you can pretty much guarantee a perfect day, and some of the most amazing scenery you will ever jog through. 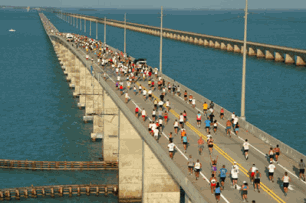 The Seven Mile bridge run is the only marathon that is held entirely across water, and with views of the water from both sides, it really is a spectacular addition to the Florida Keys calendar. And so with all these plus points, it’s doubly not surprising that behind the urge of so many people to go running, there is the urge by so many to arrange events and charitable runs throughout the year. So the list you see below is by no way exhaustive in regards to marathons, relays and running clubs, but by clicking through to the links provided, I’m sure that you will be able to find a group to run with somewhere in the Keys. Although called a Marathon, the seven mile bridge run gets its name from starting at the Marathon end of the Seven Mile Bridge. Starting early in the morning, so as not to cause too much inconvenience for the motorists who of course make the most use of the bridge, the local sheriff’s department close the bridge and allow 1500 eager runners to set off on this historic race. It’s been taking place for over four decades, and it’s quite amazing (until you consider where it is run) that since 1982 when it started, until 2012 there had been no incidents due to weather stopping this run. However on Saturday 21st April 2012, the Florida Keys lost its perfect weather reputation and severe thunderstorms caused the organisers to cancel due to safety reasons. But if that only happens once every 40 years, I don’t think too many people will be able to grumble. To take part in this run you will need to visit the website of the organisers around February to fill out the online application. This is for the seriously fit or in my mind seriously mad. As the race not only takes place at night, when the best views that you will ever run past will be hidden from you. But it’s also very very long. From Miami to Key West the race is nearly 200 miles long. Actually it’s not as bad as all that, as you won’t be expected to do it all yourself. The relay will push you and 11 of your friends and colleagues to the extremes all the way to the southernmost point of America. So after all that exercise a few drinks in one of the bars in Duval Street will no doubt be the order for the day. Of course getting down to the Key will mean that the majority of the race will be run across water using the Overseas Highway as your stepping to stone to paradise……or total exhaustion. To find our more information regarding the Ragnar Relay or even to be placed on a waiting list in order to participate, click through on the following link. So you attempted the Ragnar Relay and half way through you suddenly thought "Man, I think I have bitten off more than I can chew on this one." Well, without you feeling bad about your running experience, why don't you take a look at the Keys100 event instead? This is of course a race, but has a slight difference from others that you may have considered entering. With the Keys100 you can either enter as a lone runner, or get a team of up to 6 friends or colleagues taking turns in your own relay event. The whole race is also split into two parts, with 100k being run from Key Largo, down to Marathon, with a second part of 50k taking you all the way down to Smathers Beach in Key West. This event is organised as a soley charitable event to raise money for the Cancer Foundation of the Florida Keys. For more information on running in the Keys100 then click through to the offical website using the link below. Hosted by the Southernmost Runners Club around March each year, the Sombrero Beach run is more than just a run. This is a great day out for all the family. Wether you are fit enough to run, or can run a bit and then walk a bit, the event has something for you. With a 10k run, 5k Walk and Run, and for the fittest of the fit a 15k Challenge itdoes as a say cater for most people. Another nice thing about the Sombrero Beach run is the beach barbecue that provides refreshments after the race. So work up a sweat, and then enjoy a grilled sausage or hot dog (washed down of course with a nice cold beer) all within the gorgeous settings of the Sombrero Beach in Marathon. If you are interested in this piece of Florida Keys running, or fancy any of the runs and fun runs arranged by the southernmost runners club then click through to their official site on the link below. This race in Key Largo usually occurs in November each year. But you have to realise that this race is for the early risers in life. Just like the Seven Bridge Run, this one requires the overseas highway to be closed off for a while, so they run it early in the morning when traffic is lighter. But you couldn't ask for a better time of the day as you head through Key Largo and out onto the Old Jewfish Creek Bridge. If you want to take part and be running through Key Largo in November, then you have several different races to enter. With a choice of a 5k walk and run, a more strenuous 10k run, or for the really fit the half marathon the options are yours.